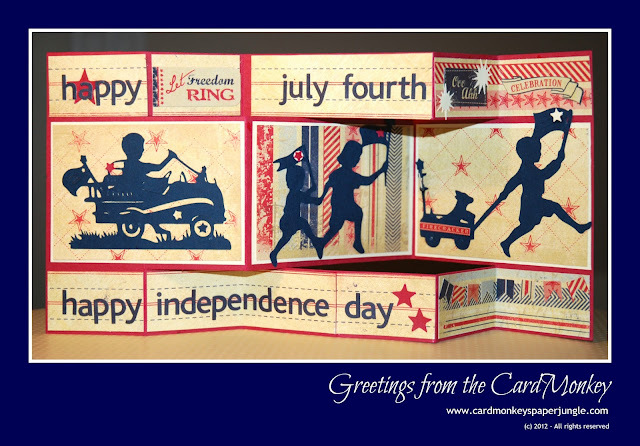 CardMonkey's Paper Jungle: Come In and See -- It's Patriotic, Day Three! Can you help but feel patriotic when working with the red, white and blue in your color palette? We're back today with Day 3 of the first-ever Blog Hop co-hosted by Carter's Crafting Corner and C'est La-Vie Designs Unlimited, LLC. 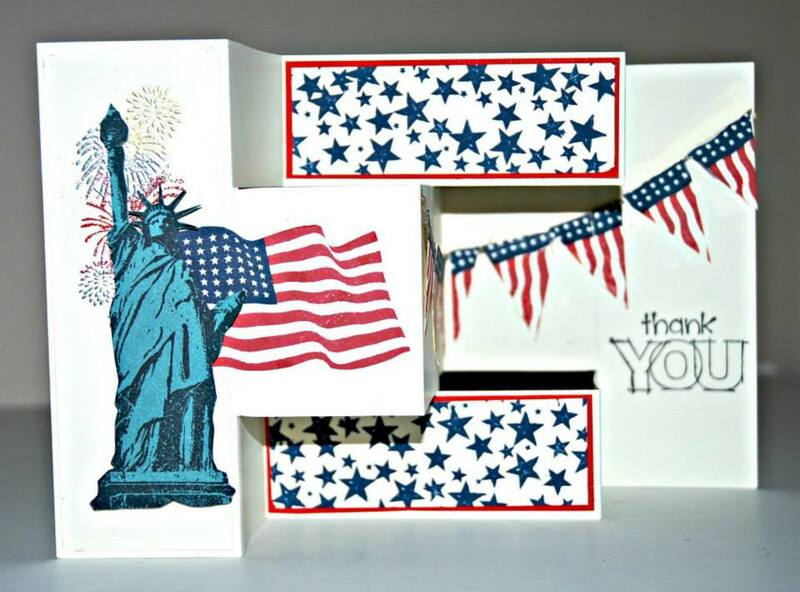 Their theme is a patriotic one, in time for you to be inspired to create your own projects for your Independence Day celebrations. That's right, we're Celebrating the Red, White and Blue, with a group of talented crafters. Today I am going to reprise a card I made last year, because it's one of my most favorite cards I've ever made. That's a tall order, because I LOVE cardmaking! To decorate the card, I used Authentique Paper, letter stickers and cut-outs using Cricut's "A Child's Year" cartridge. You should have arrived here from Charmagne's blog. If you joined us from my blog, be sure to go back to the start of the Hop (Carter's Crafting Corner) so you don't miss a thing. There are some prizes to win if you follow and comment on each of the participants' blogs. Some bloggers have their own blog candy too, with their own set of qualifiers. The Hop runs the whole weekend, from Friday June 21 at 9 a.m. through Sunday, June 23 at 6 p.m. (Central Time), so you have plenty of time to visit/comment. Your next stop after me is Alicia's blog at Golden Goddess Designs. One winner who both comments and follows me here will be selected at random to win CTMH #M1029 "True Thank You" stamp and a $10 gift certificate to my Close To My Heart store! No purchase necessary to be eligible to win! EVERYONE who purchases the beautiful "Home of the Brave" CTMH stamp set or its companion stamp set "Courage" CTMH stamp set from my CTMH site from now through July 31 will receive from me a "True Thank You" stamp for free! To purchase, you may use the link provided above BUT THEN let me know (cardmonkey@comcast.net) that you've done so, so I can send you your reward as your thank you! This gift is from me personally, and not from CTMH, and will arrive separately from your ordered stamp set. Remember... We live in the Land of the Free because this is the Home of the Brave. This is awesome!! Beautiful work! What a wonderful card! I love it! Love your card. I like the silhouette children images. I am a follower. you did an amazing job on this card!! love it! Beautiful card, love the cuts used; tfs the card tutorial too! I always love your cards Sistah! Another awesome piece of art!! You are so talented. Thanks so much for these 3 days of excellent ideas. I look forward to following you. This is my first "Hop" and I can't wait for the next one. I love this card - the trifold and the authentique paper! Great project! You’ve made our first hop a success! I hope you got plenty of new followers and enjoyed the experience! Wonderful job!!! Am enjoying the hop!!! I love making tri shutter cards. you can keep adding and adding. this is gorgeous! love the silhouettes. this would make a beautiful scrapbook layout also! Great hop & projects. I like your tri-shutter card & the wonderful images; I haven't made one of these yet & so need to! Wow! I can see why this is one of ur favorites! Thank you for the tutorial link also! Thanks for sharing- I loved it too. Makes me want to get that cartridge since I work with children! LOVe this fun card! Great fancy fold and wonderful die cuts!